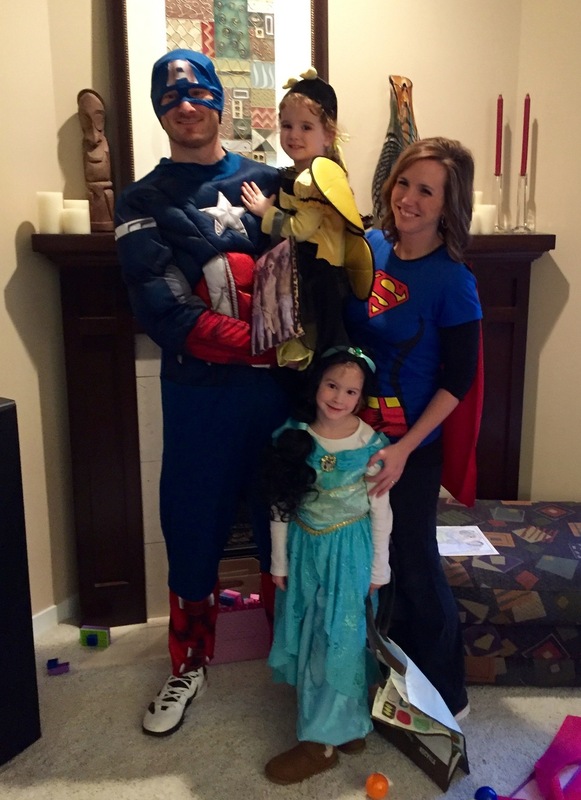 Halloween this year was a Kladder family affair at Lake Bella Vista. While Jeff headed north with our high schoolers from Byron Center Young Life for Fall Weekend (we missed him! ), Natalie and I joined the rest of the Kladders in Rockford for the weekend. 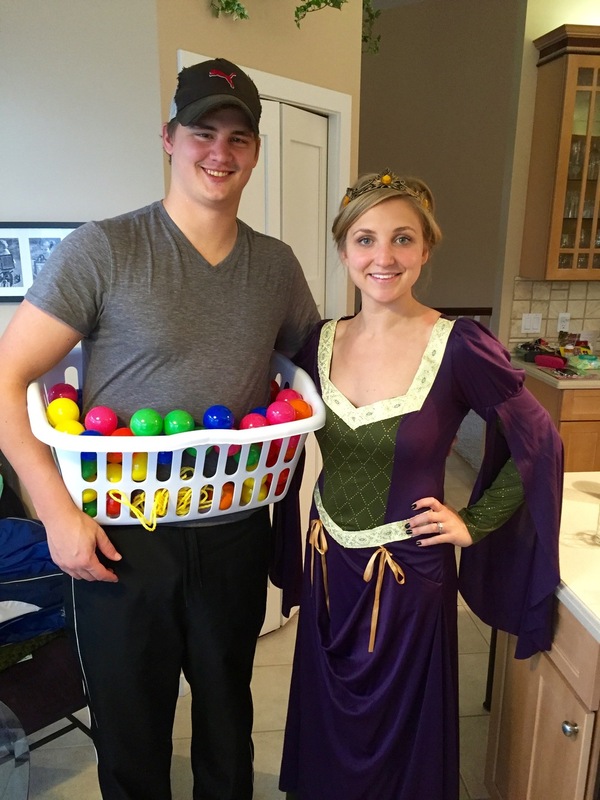 I've always been a fan of Halloween but this was the first year I've had to think through a kid costume. 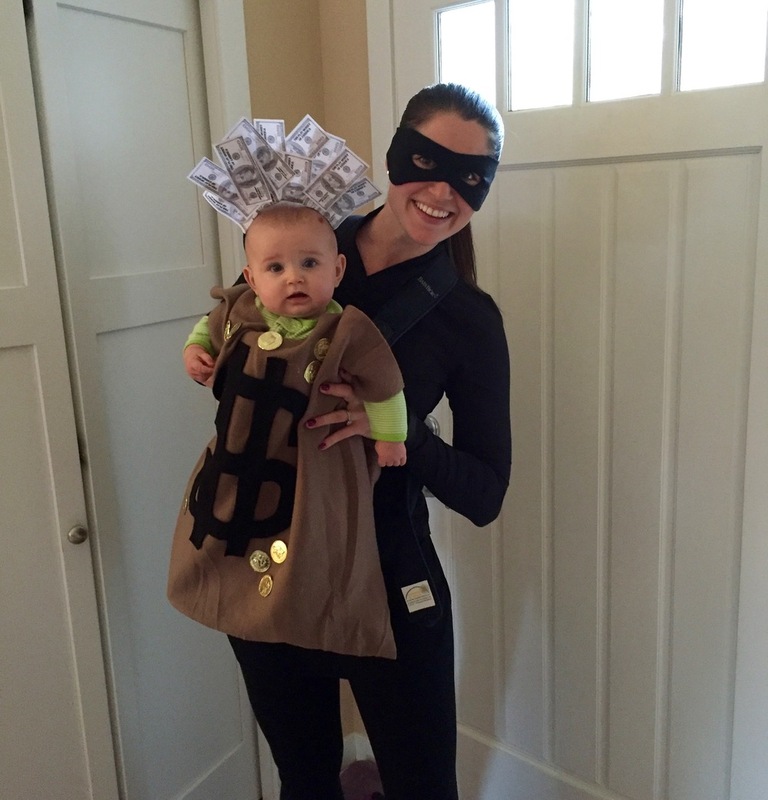 We got great feedback on our mother-daughter get up as 'burglar and bag of money.' I was pretty proud of my bargain purchases and hot glue gun handy work - an inspiration from Pinterest. The girls carved pumpkins, we ate Robinettes donuts and cider, and despite the cruddy weather we went out for some trick-or-treating fun. Natalie and I made it to a grand total of 3 houses before throwing in the towel. But at least we can say we did it! In other news: We've got a 6-month-old who's spouting teeth on our hands! Her two bottom teeth are just peek'n out and I have no idea why but I find them extremely cute. Jeff and I also celebrated our 2 year anniversary this week with dinner at Black Heron (a new place on the Westside) followed by a night cap at Sidebar. Dinner at Black Heron was wonderful. We both ordered the ribeye which was full of flavor and enjoyed multiple cocktails. Yeah, I said multiple. Quick FYI: all their signature cocktails are half off on Tuesday (usually $10/each). I found the space warm and welcoming, the staff friendly, food delicious and was quite taken by the chef who stopped by our table to wish us a Happy Anniversary. They even provided a couple glasses of complimentary champagne. Sidebar was less inviting, but quite interesting. It's true what they say, it's really small and I think because of that they are required to follow very strict fire code restrictions. We witnessed multiple people get escorted back out because we were 'at capacity.' Our drinks were made with care and you can tell their intention is to capture the drink connoisseur. They've got shakers, lemon peel, and froth up the eye balls! We hope you've been enjoying the awesome November weather as much as we have. We're gearing up for colder weather ahead and getting pumped for the holidays! Thanksgiving here we come!